This week we’re hosting Xerocon in San Francisco, attracting more than 500 accountants and bookkeepers from across the U.S and showcasing how we’re moving ahead at a rapid pace and embracing cloud technology and automation. Today as part of Xerocon we launched Xero Report Templates, an industry-leading feature for accountants and bookkeepers which changes the reporting paradigm by reducing the reliance on traditional rigid desktop solutions. It is simply the most sophisticated cloud based reporting tool on the market today and we know it helps practitioners save significant time and gives them unparalleled flexibility. In fact Xero partners using Report Templates in Australia, New Zealand and the UK (launched earlier this year) have reported the feature addition has reduced the time they spend on client reporting by up to 60%, bringing real and quantifiable impact to their practices. Xero Report Templates gives accountants and bookkeepers the facility to design and compile customized management and financial reports which can be saved for future use as templates across all of their clients. This release comes complete with a number of predefined templates which can be tweaked and customized with almost unlimited flexibility over the reports that can be created. Report Templates make it more efficient for the preparation and completion of any periodic financial reporting. By having all clients, regardless of size, on one platform this leads to streamlined management reporting for all types of clients. Templates can be designed to suit any vertical reducing the need to re-work reports for each client and more efficiently serve client needs. Practice-wide Reporting ­- Reporting is based on Report Codes not individual Chart of Accounts, so reports can be run immediately across all customers, saving hours. Customization – Layout editor with the ability to add text blocks, custom schedules, custom date/formula columns, and formula rows. In the desktop-based, disconnected world, an accountant could enforce a common chart of accounts. In a connected world where the client and accountant see the same data, this doesn’t hold true. Usually to overcome this you would have to create a custom report for each client which could take hours. It also makes practice-wide reporting standards hard to enforce, and there isn’t much room for efficiency. A couple of years ago we trialled the concept of report codes in New Zealand. A single list of codes that accountants and bookkeepers can map client charts of accounts to. 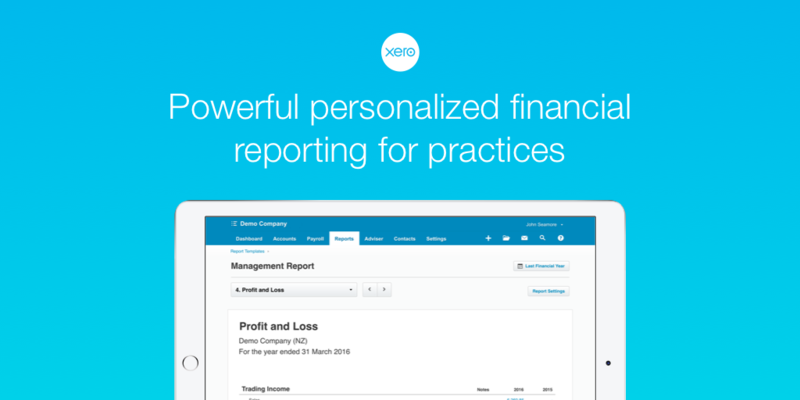 This enables the firms to create practice-wide reporting that could be applied to their entire Xero client base. Practices using Xero reports saw productivity improvements immediately as templates could also be applied easily across an entire client base. But there were some features available in desktop software that accountants missed. The benefits of cloud reporting outweighed the cost, but we knew we could do better. Report templates are practice-wide templates that give you the flexibility to create reports the way you want them. We have designed Report Templates to be intuitive and approachable, without sacrificing the features. This means partners can harness the power of practice-wide templates, while still retaining the ability to customise the reporting outcome to the needs of the client. We have now shifted the focus from compliance reporting to reporting that enables accountants to add value. They can use these reports as the conversation starter. We’re excited to be rolling out Xero Report Templates available in the US at the end of September and marks another innovation milestone from Xero. The post Reporting like you’ve never seen it for the US appeared first on Xero Blog.